When it’s the eve of Jesus’ birth, mama’s working and there’s a fresh two inches of powder dropped on your lawn, you find inside things to do with your two-year old. Since he’s still in front of a screen, it may not be much better than throwing on a movie and plopping him on the couch, but we had a blast playing with Photo Booth on my MBP tonight. He’d still be sitting in front of the camera making faces if I’d let him. We probably took 50 pictures but I’ve narrowed them down to a few that I liked. His favorite effect was the mirror camera, he liked seeing two of everything. Three through Five are great but I think Eleven is the best. It reminds me of the look he gets in his eyes when something just clicks in his brain. 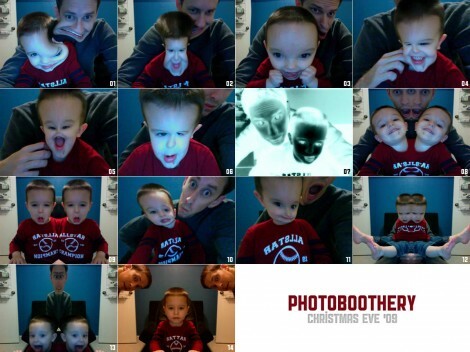 I can imagine that there is more Photoboothery™ in my future. Merry Christmas. Oh my goodness…I cannot stop laughing. Looks like y’all had tons of fun! I’m sorry I missed out on all of that. LOVE it!! !